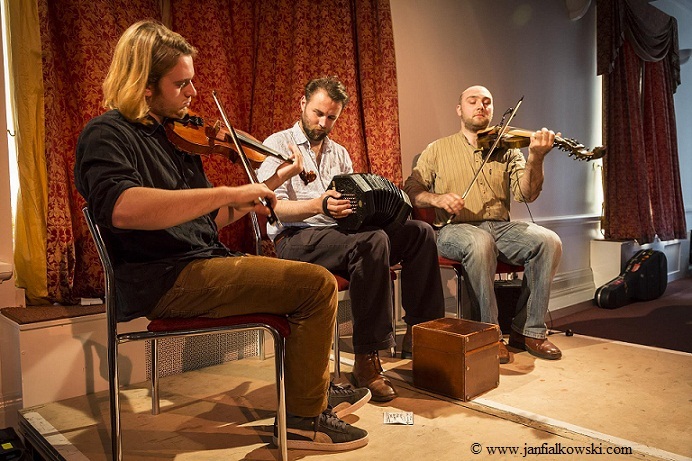 Oss is an English trio playing English regional ‘gems and forgotten songs’ unearthed from manuscripts. The featured tune is John Dipper’s reworking of a traditional English tune, played second in a surprising set with the lovely ‘Dance’ from Purcell’s 1688 opera Dido and Æneas. The self-titled EP is available from the Oss website. You can also follow them on Facebook. Nick Hart: melodeon and concertina player, multi-instrumentalist extraordinaire, maker of beautiful bones. Plays with many collaborations, including the Ceilidh Liberation Front, and for the Belles of London City Morris. WORKSHOP ALERT! Acoustic Creativity and Exploration Workshop Days with Emily Askew: Guildford 11 October, Bristol 29 November. 2015 EFDSS Creative Artist Residency with guitarist Dave Malkin and dancers Hat Vail and Helen Penn. Alma, with fiddlers Emily Askew and Nicola Lyons, and guitarist Adrian Lever. Tom Moore: False Lights, with Sam Carter, Nick Cooke, Jim Moray, Sam Nadel, Jon Thorne. GIG ALERT! False Lights at the London Folk & Roots Festival, 30 October, Sebright Arms. Moore Moss Rutter, with Archie Churchill-Moss and Jack Rutter. Phew! Great music played by great guys! Don’t forget – they’re live at Camden’s GREEN NOTE, MONDAY 21 SEPTEMBER!